When, in the natural attitude which is that of all “normal” existing beings, I “see” a house, my perception is spontaneous, and it is that house that I see, and not my own perception of it. On the other hand, if my attitude is “transcendental”, then it is my perception itself which is perceived. But this perception of a perception radically changes my primitive approach. The state of actually experiencing something, uncomplicated to begin with, loses its spontaneity from the very fact that the new contemplation has for its object something that was originally a state, and not an object, and that the elements which make up my new perception include not only those pertaining to the house “as such”, but those pertaining to the perception itself, considered as an actually experienced flux. And an essentially important feature of this “alteration” is that the concomitant vision I had, in this bi-reflexive state of the house that was my original “motif”, so far from being lost, displaced or blurred by this interposition of “my” second perception in front of “its” original perception, is, paradoxically, intensified, becoming clearer, more “actual” and charged with more objective reality than before. We are here confronted with a fact that cannot be accounted for by pure speculative analysis: namely, the transfiguration of the thing as consciously experienced, its transformation into a “super-thing”, its passage from being something “known about” to something “known”. This fact is insufficiently appreciated, although it is the most remarkable in the whole field of phenomenological experimentation. All the difficulties met with in ordinary phenomenology and, indeed, in all the classical theories of knowledge, stem from the fact that they consider the duality consciousness – knowledge as being self-sufficient and able to absorb the whole of experience. Whereas the triad knowledge-consciousness-science alone can provide a genuinely ontological foundation for phenomenology. As long as I can remember, I have always been able to recognize the colors blue, red, and yellow. My eye saw them, and I had a latent knowledge of them. Certainly “my eye” did not ask itself any questions about them: how could it have? Its function is to see, not to see itself in the act of seeing. But my brain itself was as if asleep: it was not in any sense the “eye of the eye”, but merely a prolongation of that organ. And so I simply said, almost without thinking: that’s a beautiful red – or a faded green – or a brilliant white. One day some years ago while walking among the vines in the Canton of Vaud overlooking the Lake of Geneva I had a most extraordinary experience. The other of the steeply descending slope, the blue of the lake, the violet of the mountains in Savoy, and in the distance the glistening glaciers of the Grand Combin – all this I had seen a hundred times. I know knew for the first time that I had never looked at them. And yet, I had been living there for three months. It is true that, from the very first, this landscape had profoundly affected me. But it had only produced in me a vague feeling of exaltation. No doubt the “I” of the philosopher is stronger that any landscape. The poignant sensation of beauty we experience is only the “I” measuring and deriving strength therefrom, the infinite distance that separates us from beauty. 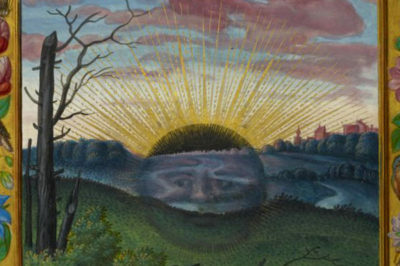 But on that day, suddenly, I knew that it was I who was creating that landscape and that without me it would not exist: “It is I who sees you and who sees myself seeing you and in so doing creates you” This cry from the heart is the cry of the Demiurg when creating “his” world. It is not only the suspension of an “old” world but the projection of a “new” one. And in that instant, indeed, the world was re-created. Never had I seen such colors. They were thousands of times move vivid, more delicately shaded, more “alive”. I knew that I had just acquired a color-sense – which I was seeing color for the first time, and that until then I had never really seen a picture or penetrated the world of painting. But I knew also that by this awakening of consciousness, this perception of my perception, I held the key to that world of transfiguration that is not a mysterious sub-world, but the true world from which we are banished by our ignorance. This has nothing to do with attention. Transfiguration is complete. Attention never is. Transfiguration knows itself in its positive sufficiency. Attention aims at attaining some day such sufficiency. It cannot be said, of course, that attentiveness is empty. On the contrary, it craves fullness. But this craving is not fulfillment. When I returned to the village that day, the people I met were most “attentive” to their work; yet to me they all seemed to be walking in their sleep.